Our Zip-Line Combos take you to the most beautiful areas of the Guanacaste region and focus on getting the most out of your day at each place while including some of the country's most exciting activities. We have taken lots of effort to compose the perfect trips and are excited to be offering these to you. However, we can customize almost anything... so, If you had any other ideas please tell us about it! .................Great tour for the whole family at the foothills of the “Rincon de la Vieja volcano” where we will horseback ride (optional), zip-line (spectacular 10 runs), do a waterslide (400 yds long), receive a deluxe organic lunch with 5 courses and then relax at the hot springs after treating us with a volcanic mud package by a beautiful river. *This is a FULL DAY of fun for everyone! Similar like Vandara and also in the same area around “Rincon de la Vieja volcano” but besides the horseback riding (40mins and optional), zip-lining (10 runs through the treetops), waterslide (400 yds through the forest), lunch and hot springs we will also walk hanging bridges and can optionally hike to a beautiful waterfall (no swimming opportunity there). Also a great place to spot wildlife! *This is a FULL DAY of excitement for an active group or family! Borinquen is a deluxe estate on the “Rincon de la Vieja volcano” where we will experience the best zip-lining in the area along 12 cables that take us along and across a jungle canyon and by a breathtaking 100ft waterfall. We will also horseback ride (optional and 40 mins), receive a deluxe lunch and then relax at the natural sauna, mud baths and hot springs that are located right next to a steaming volcanic site! *This is a really great day IN STYLE with superb services! This tour is located just passed Liberia at the very foothills of the “Rincon de la Vieja volcano” where we will have a fun filled morning with zip-lining along and across a beautiful canyon followed by an optional rappel & climbing section. After this activity we will go rafting down the exciting Class 2-3 River either on rafts (1:1 guest-guide ratio on each raft) or inner tubes for about 45-60mins. Lunch is next and we will end the day swimming under a beautiful waterfall nearby Liberia. *Lots of Adventure around our beautiful rivers! After the action follows the relaxation: We will relax in the natural volcanic healing waters of "Ecotermales Hot Springs", settled in the lush rainforest wjere we will also have an early dinner before returning home! 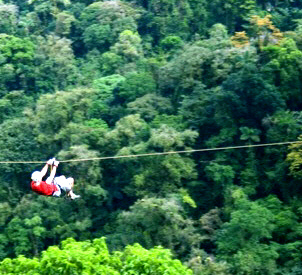 *Superfull Day to Costa Rica's most iconic volcanoes with the best in zip-lining and hot springs! The Tropical Cloud Forest is one of the richest ecosystems in the world and only occurs on higher altitudes along the continental divide. On this trip we will immersed in the virgin forest of Monteverde and enjoying some of the most adventurous activities in Costa Rica! First, we will do the extreme zip-line adventure along 13 cables, 17 platforms and beautiful trails in between sections. These really long, fast and exciting cables will get your adrenaline pumping - guaranteed! The longest is about 1K long (50-60mph!)! In addition, and only if you feel brave enough, you will have the option to do the thrilling Tarzan Swing! Arguably, the closest experience to bungee jumping :) Next is lunch and we will choose between several options of appetizers (soup or salad), main plates (meat options, fish, rice & chicken, etc..) and also have a dessert. The second part of the day starts with visiting the hummingbird garden where we will be in the middle of hundreds of these colorful creatures and continue with the hanging bridges hike along some of Costa Rica's best and most stable installations that take us high up into the cloud forest's canopy where we will have chances of spotting some of its famous inhabitants. This hike takes about 1-1,5hrs on well maintained trails on a fairly even level throughout (instead of the hanging bridge hike we could also take a guided tour of the butterfly farm). This is a really nice experience in an environment taken from a fairy tale! 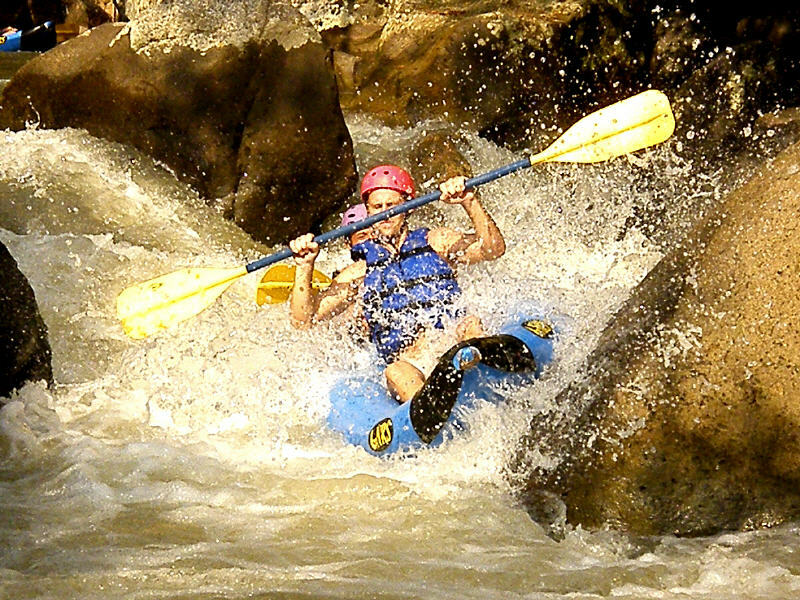 *Superfull Day to Costa Rica's most unique natural environement and extreme adventures! !